TRAVERSE CITY, Mich. — Sen. Wayne Schmidt on Wednesday teamed up with the American Cancer Society and other legislators to bring attention to various cancers and the critical need for additional research. Suits and Sneakers originally began with basketball coaches but has quickly spread to numerous professions. Business professionals, coaches, teachers and many others opt against their dress shoes for a day and instead choose to lace up their tennis shoes to stand in support of those fighting cancer. Editor’s note: A print-quality version of the above photograph is available by clicking on the image or by visiting SenatorWayneSchmidt.com/photowire. Audio of Schmidt discussing his participation is also available on his website. 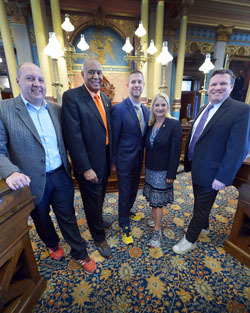 Photo caption: State Sen. Wayne Schmidt, R-Traverse City, shows off his sneakers on the Senate floor as he and other legislators and staff raise awareness for the American Cancer Society by participating in Suits and Sneakers. The annual event encourages professionals from all career pathways to choose tennis shoes for a day instead of their normal dress shoes.